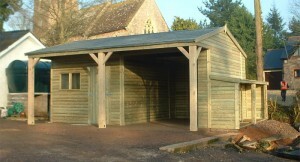 Carport and Workshop - Blamphayne Sawmills Ltd. If you can’t find a shed that you like then please call us to discuss your requirements. Alterations to style, size, position of doors, windows, type of flooring, roofing, etc. can be made to suit your needs.